If you were to choose just one of the attractions in Lampang then Wat Chaloem Phra Kiat Phrachomklao Rachanusorn will have to be it. Located in the north of Thailand, 112 kilometres (70 miles) from Chiang Mai, Lampang is a town where time stands still and it's here where most of the town's temples can be found. And just 54 kilometres (33 miles) from town is one of the most bewitching Buddhist temples in all of Thailand. Very few tourists get the opportunity to see this stunning site. I've seen some truly amazing sites around the world but this one really stood out for me as I'm sure it will do likewise for you. It's not often that you come across such extraordinary treasures like this one. If you're anywhere near Lampang, you must go and check it out. It may take a little effort to get there but it will certainly be well worth your while. I cannot wait to find the next hidden gem in Thailand. While you are welcome to take a Songtaew (kinda taxi ride) for a few Baht to Wat Chaloem Phra Kiat Phrachomklao Rachanusorn, one of the other great attractions in Lampang has to be the charming city itself. 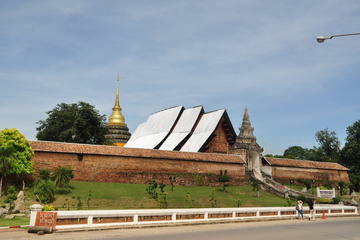 Why not take a Lampang city tour from Chiang Mai and back again as described in the link below. For this tour will take you to the leading centre of Lanna culture. You will also visit historical sites, ancient temples, local markets, a ceramics museum, the Thai Elephant Conservation Centre and the Friends of the Asian Elephant Foundation. Lampang is much older than Chiang Mai and has some of the most beautiful temples of Northern Thailand. Lampang is also known as Mueang Rot Ma which means "Horse Carriage City" and is considered by the locals as the last paradise in Thailand. Here you'll find horse-drawn carriages in regular use as transport. Lampang is connected by rail and a four-lane highway to both Chiang Mai and Bangkok. During the 19th century, Lampang became a centre of teak logging with at least 4000 elephants working in the area. For a better overview of this city tour, simply click on the photo or link above. This is a full two-day tour departing from Chaing Mai. And included in the tour are meals and an overnight stay at the Lampang River Lodge as well as an hour long horse carriage ride through the streets of Lampang. The Chaloem Phra Kiat Phrachomklao Rachanusorn temple complex is perched high on top a rocky hill in Lampang's countryside, nearly 1,000 metres above sea level, offering you a truly unique Buddhist shrine and temple visiting experience. Apart from the temple's location being the pinnacle of its emerging fame, here you'll get a spectacular and panoramic view of the Thung Thung valley below. Wat Chaloem Phra Kiat Phrachomklao Rachanusorn has long been a Buddhist pilgrimage site due to a Buddha footprint believed to have been made more than 2000 years ago. The present site was upgraded in 2004 to commemorate the late King Rama IV 200 year anniversary. Its many structures sit on three separate tiers and require different modes of transport in which to reach. The main temple hall is on the first tier which you can easily reach by road yourself, but to get to the second tier where the Buddha footprint rests, you'll need to take the local Songtaew taxi. You could charter your own Songtaew for 600 Baht for a round trip or you can hop on one with other locals and tourists for a 60 Baht round trip. To reach the top tier, you'll be required to go by foot. The top tier is known as Doi Phra Bet and it's here is where you'll see a golden Pagoda and a small bell hall on one side. And on the other side sits a prayer hall. If you look to your left of the prayer hall you'll see many white Stupas scattered around the hillside. They are an unbelievable sight to behold and well worth the effort getting here. Wat Chaloem Phra Kiat Phrachomklao Rachanusorn represents a strong religious faith that reflects in its architectural grandeur. You'll find this amazing Buddhist pilgrimage site in the Wichet Nakhon sub-district of Lampang which is just off highway 1035.